Kilts and Scotland, can you imagine one without the other? These two words fit so well together that kilts and Scotland have almost become synonymous. In fact Scotland is a country almost unequaled in it's natural beauty, and its culture has been spread around the world. Since the early seventeen hundreds Scotsmen have been setting sail for far distant shores, taking with them their language, culture and of course their kilts. It was at this point in Scottish history that the clans were facing great hardship, at the hands of the English. The wearing of tartan and kilts had been banned, and their way of life was under threat. So they set sail to create new lives for themselves and their families, many thousands of them settling in America and Canada. And that cultural influence is very evident today in both America and Canada, and its for that very reason that both countries now celebrate Tartan Day which has become a national holiday. Its an event that is growing in popularity since its inception in America in 1998, and one that is often attended by Sir Sean Connery, who as a patriotic Scotsman loves to promote his homeland. The history of the kilt is of great interest to countless people around the world (one reason why I built this web site) and the number of different tartans is enormous, with more being added every year. Kilts and Scotland though are not exclusive, they are in fact also worn in other parts of the United Kingdom, which is further evidence of the Celtic influence across the British Isles. and of course it is worn in many other countries around the world. For those of you who are lucky enough to holiday in Scotland, the opportunities to see the kilt being worn are plentiful. And just to whet your appetite kilt Scotland photos looks at some stunning Scottish scenery, and kilts in different settings. One such setting is the Scottish wedding, as many couples choose it as their wedding theme, so ensuring a romantic and enchanting venue. Highland Games are a wonderful chance to see athletes competing in their kilts, along with Highland dancers, and of course pipe bands. But it is not only bands which compete, there are also competitions for individual pipers. 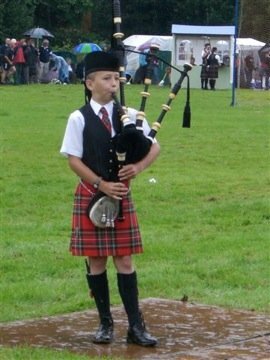 The Gathering, during that trip he also attended the Highland Games at Killin, where he took this photo of a young lad competing in a piping competition. The Edinburgh Military Tattoo is also a spectacular Scottish event, that is awash with kilts and one that I highly recommend you visit if you're in Edinburgh during August. Hogmanay (New Years Eve) is also a big celebration in Scotland, with the kilt being worn by many revelers looking to take in the New Year, in traditional Scottish style. As you can see you don't have to look very hard to find kilts being worn in Scotland, the garment is in fact growing in popularity every year. And so long as people just like you continue to show interest in your Celtic roots, the future of the kilt is assured.